I had my initiation with video games back in grade school, and it was through Nintendo's Game n' Watch. These nifty little devices had just one game built-in for each, so you had to buy a number of these to play with. The gameplay was very simple; either you avoid something, or you catch something. The most popular titles includes Parachute where you have to catch the paratroopers in your boat; there's Octopus where you need to avoid the octopus' tentacles and stock up on the treasure, and Fire, where you catch the people falling from a burning building into a waiting ambulance. Simple, yet addictive gameplay. So engaging the games were that even my mother and aunt played with us til the wee morning hours! I had been acquainted with the GameBoy Micro only recently. I have seen it in stores but the screen was so small I did not find it to my liking. However, I have played on one recently and it was great! The screen was just ok. Best of all, it accepts game cartridges from the GameBoy Advanced line! Luckily, we have a cartridge with the oldies but goodies in it such as PacMan, Mario, and Galaga. It's really cool playing those games; brings back happy memories. 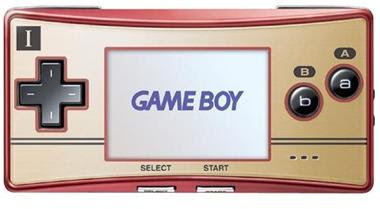 Pictured above is the GameBoy Advanced edition sporting the Game n' Watch design.